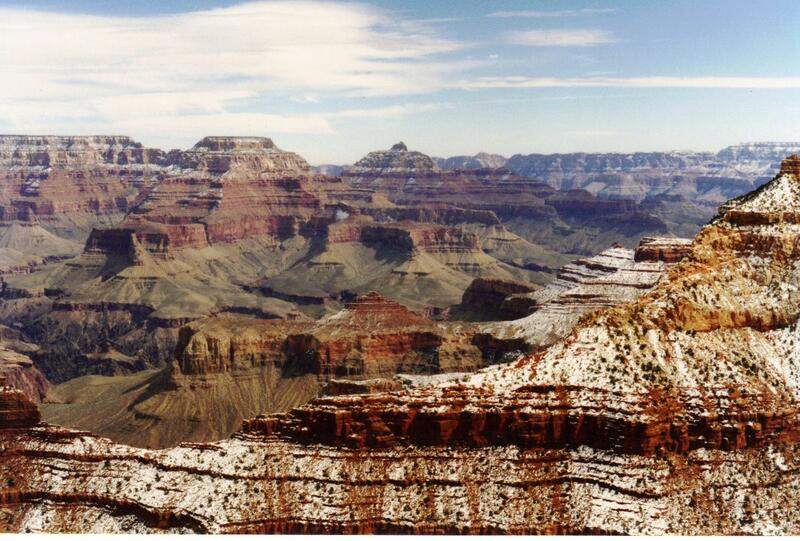 Eventually in the late afternoon we landed at Grand Canyon Village which is located on the South Rim of the Grand Canyon, right in the national park, and whose only real function is to accommodate visiting tourists. Its origins trace back to the railroad built to the canyon in 1901 and many of the buildings in use today date from that period. We found the motel, had a drink and a quick look around and then set about arranging our transport to the South Rim visitor centre where we due to rendezvous with Mum and Dad who had reached the destination in the coach with everyone else. It was another early start today and so early that it was still dark when we checked out and boarded the coach because there was a lot of travelling ahead as we headed west to Arizona and the Grand Canyon. Our first stop today was at the Four Corners monument where four States meet at one intersection and it is possible to be in all of them at the same time by standing in two and reaching down and touching the others. To get there we drove across a featureless landscape where distant mountains stood like islands in an ocean of desert and through a landscape scoured by erosion, a skeletal land stripped of all but the most minimal vegetation. Mesa Verde National Park is a UNESCO World Heritage Site that features numerous ruins of homes and villages built by the ancient Pueblo people. It is best known for several spectacular cliff dwellings which are structures built within caves and under outcroppings in cliffs, including the Cliff Palace, which is thought to be the largest cliff dwelling in North America. 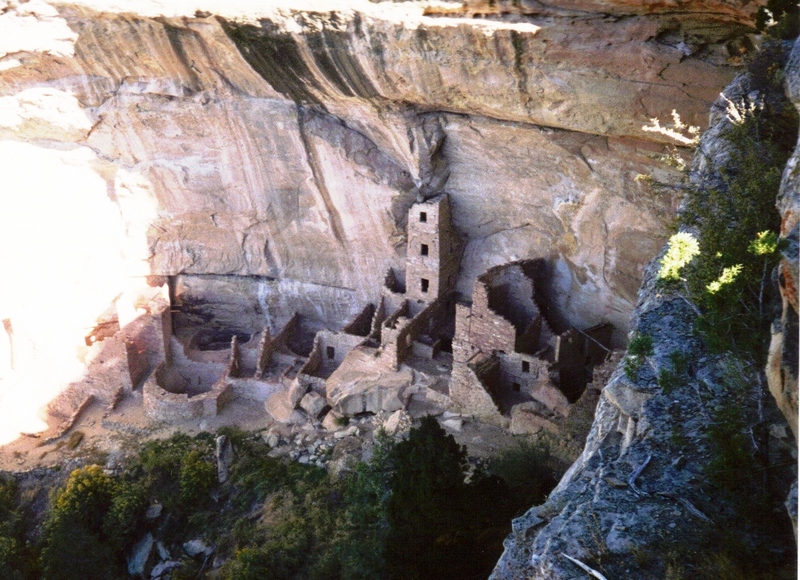 This unique treasure remained undiscovered for six hundred years until on a snowy December day in 1888, while two ranchers were searching Mesa Verde’s canyons for stray cattle, they unexpectedly came upon Cliff Palace for the first time since it had been abandoned. Today at the start of the second week of our holiday we were driving towards Southeast Utah which is part of the arid rocky expanse of the Colorado Plateau and is an area of land that is dissected by the immense canyons of the Colorado River and a high desert region that can experience wide temperature fluctuations, sometimes over forty degrees in a single day. Summer temperatures often exceed one hundred Fahrenheit, making the region a bit uncomfortable I imagine, so we were pleased to be here in October on a very pleasant sunny day with a big blue sky and a perfect temperature.